Aphids are almost everywhere. Avid and even amateur gardeners are likely to encounter these tiny pests at some point. There are many species of aphid. Most are green, but others are black, yellow or white. Some have wings and can fly short distances and some are quite slow-moving. Whatever the variety, they all prey on plants. 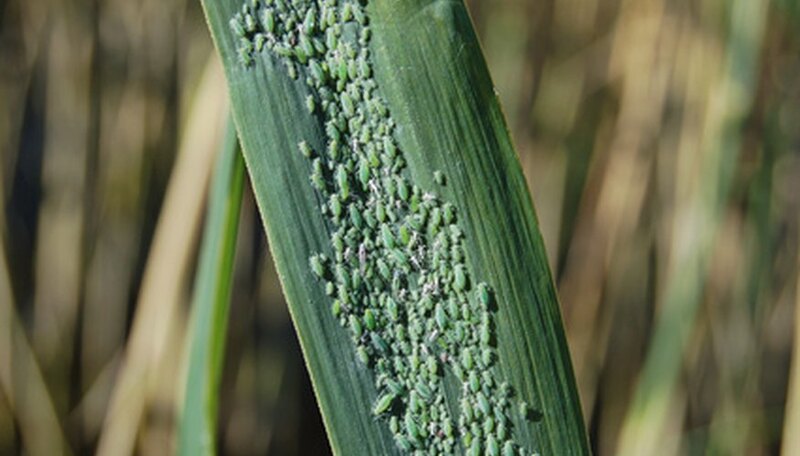 Aphids are almost never a lethal problem, but they attract other pests and fungal infection. Luckily, these soft-bodied pests are easy to control with a bit of household dish soap. Mix a solution of 2 tbsp. of household dish soap into 1 gallon of water and stir well, but don't agitate it enough to make lots of bubbles. Transfer some of the solution to a small hand-held sprayer. Spray it on all of the affected plant tissue, paying extra attention to the underside of leaves where aphids like to congregate. Also spray the soil at the base of the plant. Wipe off any visible aphids with your fingers. Re-spray the plant once weekly as needed until the infestation has been controlled. Repeated applications of soap spray may burn your plant's tender shoots, so do not use it more than three times in a row. Avoid using synthetic fertilizer on your plants. These often contain high amounts of nitrogen that stimulates the overproduction of new shoots--aphids' favorite food. If this is your first time using dish soap spray on this variety of plant, test it out by spraying a few leaves. Wait one or two days to see if the soap spray damages the plant's tissue. If it does, explore other methods for aphid control like pruning affected tissue or spraying the plant daily with the hose.